What do dog licenses, water permits and bawdy houses have in common? They are all resources that can - and should - be utilized in genealogy. You should walk into every new search with this simple concept: There are no limits. Your adventure back in time should include every facet of life imaginable. Using your imagination and ability to think creatively is just as important to your research process as your ability to cite sources and transcribe records. The available resources are surrounding us; all we have to do is open ourselves to the possibilities. While rummaging the shelves in the local library, I stumbled upon Historic Sites in Summit County, Colorado: A Consultant Report to the Board of County Commissioners by Douglas S. Walter from 1976. This text includes a review of the current status of the more significant sites in the county, as well as environmental impact plans designed around their preservation. How did it help my genealogy search? The author included background information on the original owners of a historic building, and it became a source that went much farther than land and property records. Another wonderful resource I have utilized often was prepared by the Summit County Information Systems Department; GIS Group, titled simply Summit County, CO Address Book (Summit County, Colorado, July 2003). There are some wonderful resources available that can explain the GIS system and its uses in genealogy, but what I value most about this particular book of maps is that it identifies the historical mining claims under the present day infrastructure. The volume allows me to put historical sites into context very easily, including the sites that no longer have existing landmarks. Let's get back to those dog licenses and water permits. Luckily in my town, those were all kept in one volume, which was recently pulled out of a closet at town hall. Because I make a habit of visiting the town clerk on a regular basis, I was there the day the staff had pulled all the "old books" out of storage. They were preparing to take them to the local heritage preservation organization for storage in the archives. When I inquired about the rather haphazard stack, I was told, "Oh, those would not be of interest to a genealogist." How wrong they were! The first piece I looked at was the "Register of Licenses Issued for the Year 1882-1896 for the Town of Breckenridge." Included in this long hidden gem were lists and lists of names - very exciting to a genealogist! Register of Licenses for the Town of Breckenridge. Photo by Jen Baldwin. The pages included who obtained saloon permits, liquor licenses, and permits for running billiards tables. Prostitutes were required to pay for a permit. (Whether they used their real names or not has yet to be determined.) Traveling shows, peddlers and "express wagons" were required to be licensed by the town before they could sell their wares or perform their act. I found myself looking at 14 years of the town's population and those that traveled here. Did you notice the year span? This one volume tells me a great deal about the population of Breckenridge, Colorado for a period that includes 1890, the year without a surviving U.S. federal census. At the very end of that volume were three pages that included dog licenses. The register includes what they paid for the license, if the dog was male or female, and the address of the animal's residence. For a town that never had any form of directory, this suddenly became a very big find. Who knew that dog licenses could lead to identifying the physical address of more than 100 residents? This creative thinking certainly does not begin and end at published books or registers. While enjoying a summer hike with my family, we stopped at a common resting spot to consider the options available. The sign and map describing the area were very well done, and I soon realized that the map was a great resource for me. It provided today's locations as well as the traditional names of the dirt roads in the area, all in one source. The photograph I took of that sign has proven to be so useful to me that I actually had it printed in poster size, framed, and hung it in my office. 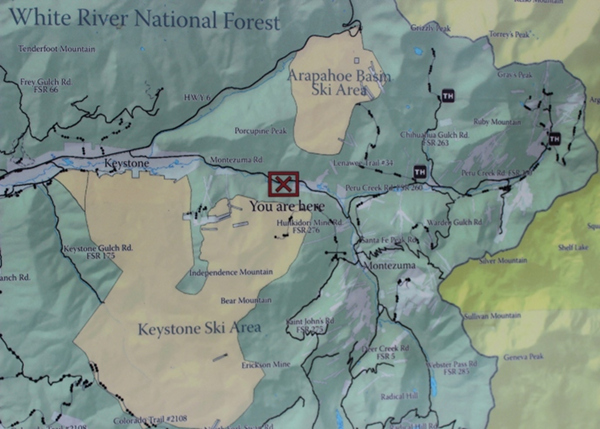 I have yet to find a map in a printed resource that matches that trail head sign, and I refer to it often. Map at the trail head. Photo by Jen Baldwin. A stop at the local Forest Service Office brought much more than I expected, including a collection of historic photos from the surrounding area, many of which I had not seen before. One of those included an image from now buried Masontown, Colorado of the Sabatini family, posing on the stamp mill. The true discovery moment came when a staff member noticed that I had looked at nearly all the historical images, and inquired as to my interest. When I explained that I was a genealogist, her first reaction was to hand me a forty-five page document that detailed every historical piece in their entire collection. This guide described photos, field guides, maps, and other miscellaneous items that somehow related to the general area of Summit County, its residents, and the forest. Not only were they able to provide me with a prepped inventory, they have the entire collection on site and available to the community. A recent search on Google Scholar allowed me to discover "In Memoriam: Edwin Carter" in The Condor, the journal of the Cooper Ornithological Society (vol. 31, no. 5, University of California Press, Sep-Oct, 1929, pp. 196-200). Edwin Carter became one of the most prominent historical figures of Colorado after he turned his house into a museum and wildlife display. The museum is still operated in the town of Breckenridge. Having never heard of ornithology before, this was certainly an article I would have otherwise missed. Pieces of the puzzle can sometimes be difficult to find, and when that happens, I typically switch my focus to social history. How did this person live? One source I love to peruse for ideas is the online collection of Sears and Roebuck Catalogs. You can find many of them online via Google Books. These very important pieces of our cultural past make it easy to step back into time. What better way to understand their daily life than to see the tools they used to live it? The key to creative internet searches is learning how to search effectively. There are a variety of resources available to the genealogical community, and my first suggestion would be to seek those out and develop advanced Internet search skills. I have heard the comments about my "genealogy luck" more than once. My opinion, however, is that none of these discoveries has anything to do with luck at all. The key to creative sources is to keep an open mind, and to not be afraid to simply ask. Talk to everyone behind a counter that will listen - and to those who will not - and be politely persistent. We have all had those days when the clerk just will not answer the phone, the email that does not get returned, the research request that gets "returned to sender" unopened (and yes, I still do send some requests by mail). This is the time to break out your charm, your bright smile, and your friendship. Offer those to your local clerk, no matter where your research is, and see what happens as that relationship develops naturally. I was unable to reach a clerk's office in a neighboring county; I tried unsuccessfully for three or four weeks. I finally asked my county clerk staff if they knew anyone, and I had an answer and a copy of the needed document within an hour. The often talked about networking should not end with fellow genealogists, nor should it start there. Your networking must include the local clerk's, the owners of the restaurant that is in a historically significant building, the owner of the closest bookstore. It is within those human resources that you may find the most significant value to your research. Creativity in your research can come in many forms, and I hope that my real life examples have helped you to understand that in genealogy, there truly is no limit. Every facet of life and human society can make an impact on our ancestors, so no question should ever go unasked and no resource should be ignored.